To invite a friend to join this event, check the box next to their name below. Remember that even if this event is set to be viewable by "members only", people that you invite will be able to view the event as though they are members. Event Description 2nd Annual "Dia de Los Losers" Chops and Rods Show! Bring your MACHINES, and take part in all the debauchery! 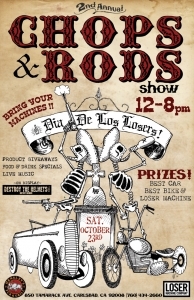 Product giveaways, food & drink specials, live music by Duane Peters, and prizes for best car, bike, and LOSER MACHINE! No photos have been added to this event yet.